Get two legendary effects in one board-friendly pedal. The legendary Keeley Compressor and Red Dirt Overdrive have been packed into one small and powerful stomp box! 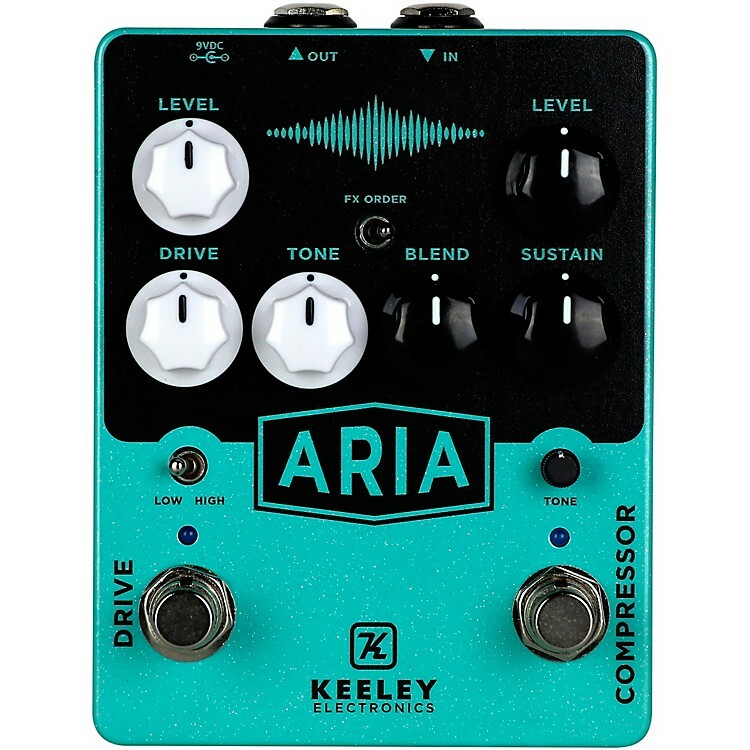 The Aria Compressor Overdrive features a perfectly voiced treble recovery circuit and blend control. This is our most toneful compressor yet boasting beautiful sustain and bloom. The blend and tone controls allow you to perfectly adjust the output response of the compressor. No more dull and lifeless sounds that are overly squashed. The newly redesigned tube style overdrive circuit features our super overdrive Red Dirt sound as well as the very clean and bold White Sands transparent drive. These two modes have been fine tuned to offer an even more impressive gain range. Simple Volume, Tone, and Drive controls with a toggle switch to adjust between low and hi gain. Compressors and Overdrive are a fundamental part of recording and performing guitar. Most people run compression before drive to reduce idle static. Using compressors after drives offers a very smooth and even tone, tons of sustain and usually a very warm and rounded tone profile. Compression before drives gives you a consistent output volume and gain level in general. Each half of the Aria Compressor Overdrive provide a ton of volume for boosting and pushing your amp as well as tone shaping controls to perfectly set up the core of your guitar tone. Not to be overlooked, the Aria features TRS insert jacks that allow you to use each side of the pedal as though they were independent circuits. From nearly every Nashville session-ace, to the praise and worship band at churches in small towns, from Steely Dan to Steve Vai the Keeley Compressor or Red Dirt has been part of the recording and touring sound of these legends and many more, for nearly two decades. Now these two foundational tones are together in one epic stomp box that is easy to use and full of features for laying down your core tone.